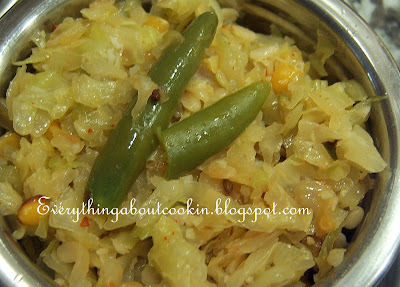 Cabbage when cooked correctly tastes great.Stir fried on low heat in its own juices with some peas and no additional masalas.This is just what I needed after a series of housewarming ,birthday and anniversary parties. 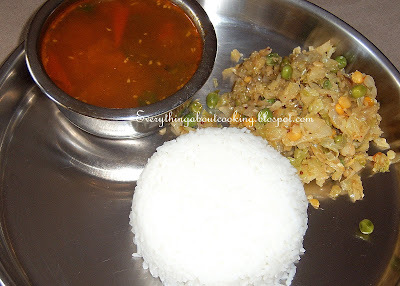 Good accompanied with rasam,sambar,curd rice or simply on its own. Heat oil in a kadai and add mustard seeds and cumin seeds.When they start to splutter add the dried red chillies,urad dal and chana dal,when they start to turn color add the crushed garlic,curry leaves.Now add the green chillies and fry for a min.Add green peas and let cook for 4-5 mins.Add the chopped cabbage and turmeric and fry on high heat for 3-4 mins.Take care not to burn.Reduce heat to medium and cook covered till the cabbage is cooked about 15-18 mins adding a little water if necessary.Remove lid,add salt and grated coconut and fry a couple of mins.Enjoy!! !